Faye Samuels once asked her husband, Stan, why he became a lawyer. His response was, "Because I wanted to help people." These words exemplify the very heart of who Stan Samuels z"l was, not only in his law practice, but as a husband, a friend and a mensch. Born and raised in Portland, Stan practiced law for more than fifty years and represented many Jewish families. He was a success at a time and in a profession that was not always welcoming to Jewish entrants. A quiet and principled man with high ideals, Stan lived his life with the utmost integrity. Whether attending to his law practice, or serving the community, Stan never compromised those values. As a family, the Samuels were great supporters of the Federation and the Jewish community's institutions both in Portland and abroad. As a Federation Allocations Committee member, Stan was acutely aware of the needs and unmet needs in Oregon's Jewish community and was compelled to make a difference. 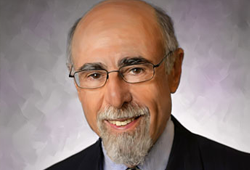 Stan chose to ensure that his commitment to the Jewish community would always be met by endowing a gift to the Jewish Federation of Greater Portland through the Oregon Jewish Community Foundation. "Stan believed we should support the general community, but it was important for us to put our major emphasis on our Jewish institutions because there are so few of us to support these institutions," said his wife, Faye Gordon Samuels. Stan had intended that this gift be only the beginning of a much larger bequest to the Jewish Community. Sadly, he died unexpectedly in the fall of 2010. His loss was a shock to all who knew him. "He had planned to do so much more," said Faye. "He worked out regularly and followed a strict diet. He expected to be here for a long time. So you never know. If you are planning to do something, you need to do it." Stan's memory will forever live in the hearts and minds of those who knew and loved him. His legacy will forever live on through the Stanley Samuels Endowment Fund at OJCF. The fund will provide support for Federation's annual campaign in perpetuity. While we mourn Stan's loss, his gift will be a permanent reminder that our community and OJCF was blessed to have known such a fine man.